I have extended the Cat Lovers Hop!!! Now you can link up through the weekend!!!! I will also add a couple extra days for comments, too. So now...........LINK UP on the main post by 11:55 pm Pacific on Sunday, Nov. 1st. COMMENT on linked projects through 11:59 pm Pacific on Tuesday, Nov. 3. The reason I am doing this is because I got the sweetest note from a crafter who caretakes for her 97 yr old momma. She had tried all week to be able to get a card made, but the demands made it impossible. She wrote telling me how nice it would be to have it extended through the weekend......and I was happy to oblige! This way the link-up is actually open an entire week, so that works. I hope you all understand. For those of you who have already linked up projects, please don't feel like you need to do two more for these additional days. I probably won't do any others, myself. You are welcome to link more up, though, if you wish! This is mostly to accommodate those who just couldn't squeeze crafting in during the week. Thank you, again, for all the wonderful projects and comments you have left for me and for others. I feel like I have made lots of new friends through this hop. Hope you have, too!! Wow!!! This has been a fabulous Cat Lovers Hop week, hasn't it? I can't thank you all enough for the fun I've had looking at the totally wonderful and creative cards and other projects you've linked up. I haven't made it all the way through the list yet, but I will. Your participation has been awesome, but what I have REALLY enjoyed was how willingly you have shared the heartfelt and touching stories of your kitties!!! I have laughed and I have cried reading about how so many of you have adopted rescues, bottle-fed tiny kittens, cared for your beloved aging pets, and shared your life with these amazing animals......our cats. Thank you sooooooooooo much. By the way, I will be starting a folder for our Cat Lover Hop projects on my Pinterest page. I know I will want to browse through it in the future! For this last day of the hop, I am showcasing another of our sponsors: Newton's Nook!!! Please join me in thanking the terrific people (and the real Newton, too, of course) at Newton's Nook for sponsoring!! I also want to give special mention to one last company who is another of our terrific sponsors: Art Impressions!! I, unfortunately, do not have any of their wonderfully amusing cat stamps so I couldn't showcase them with a project. 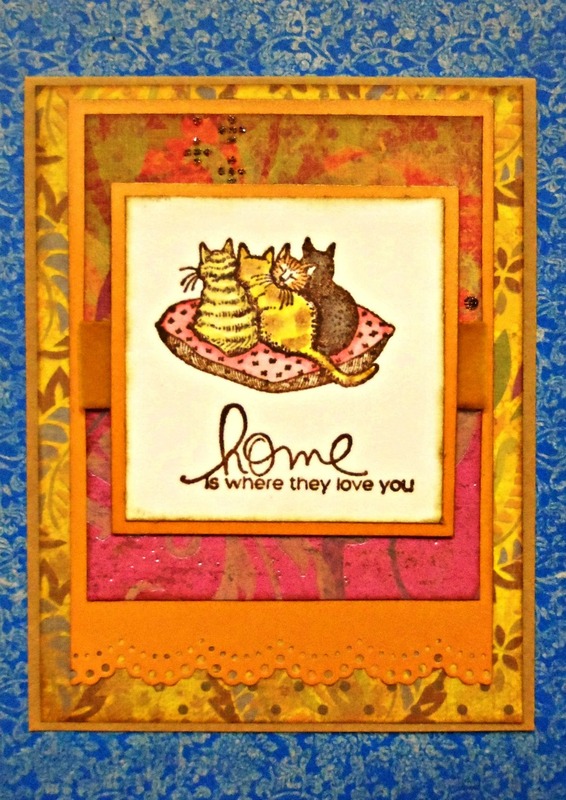 (That's why I am soooooo jealous of whomever wins their Cat Lady tri-fold stamp!!!) I know some of you have used their cats in this hop, though, and I really appreciate that. I hope you all will join me in thanking them for sponsoring, too. You wouldn't believe how much trouble I had with this card!!! 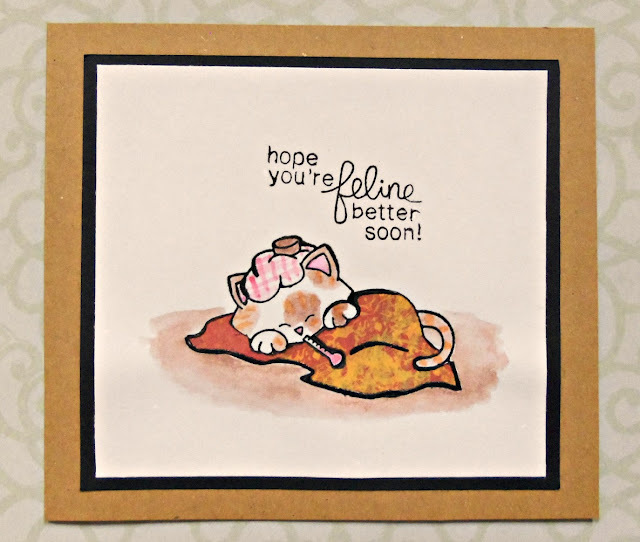 My heat gun died in the middle of heat embossing this adorable image and sentiment from Newton's Sick Day. Did you hear what I just said???? MY HEAT GUN DIED!!! I had just finished heat embossing the K&Co scrap that I used to piece poor Newton's blanket.......I switched off the gun and reached for the white cardstock to heat emboss it and hit the switch again to turn it on and.....nothing....zip....nada. This was my first heat gun and so I've had it for many years. It has given me reliable service without so much as a single grunt, grumble, or unkind word and with no warning, no zapping noise, no sparks or smoke, it died. Waaaaaaahhhhh!!!! So my only option was the toaster oven!!! Yes. The problem is that you have to have the door all the way closed for it to heat up....and I couldn't get it hot enough to melt the powder by holding it in the prewarmed oven compartment with the door open. So I nervously put the entire panel inside and pushed down the toaster button, standing ready with my toaster tongs and a glass of water.....just in case!!! Ha. I had a false start or two where I opened the door too soon, but the powder finally melted and I didn't even burn the house down!! It's not really bonded onto the paper perfectly and I DO NOT recommend this technique, but it worked for finishing the card and that's what counts!!! Well, that's my last cat project for the hop. Remember that you can still join the Cat Lovers Hop by linking up a cat-themed project (by 11:55 pm Pacific Sunday, Nov. 1) and/or commenting on the linked projects (through Nov. 3). The Guidelines/FAQ page is here and you can link up on the main page. Thanks so much for ALL the fun and inspiration this week! Hugs to you and your beautiful cats!!! Here's one that's not about cats, but I love it sooo much. If you have ever been around rescue/rehab baby owls, you have seen them do this kind of thing. So cute!! "This toy was meant to comfort this orphaned owl, but instead it inspired a new career!!!" 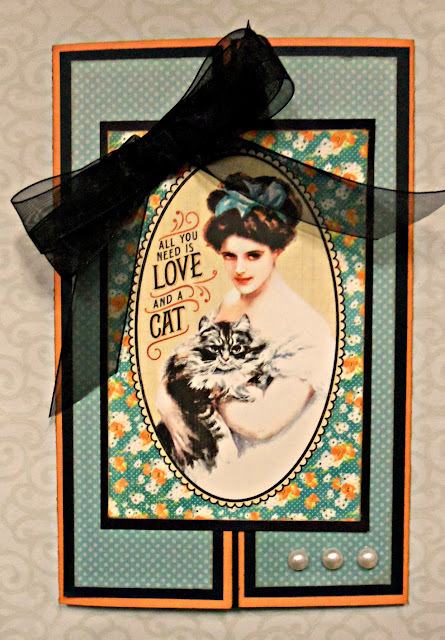 I am showcasing two more of our fabulous Cat Lovers Hop sponsors with this project: Paper Smooches and Serendipity!!! I hope you will help me show them how much we appreciate their generosity by going to their blogs and/or social media sites and telling them thank you. I love how many of you have been doing this already!!!! The "trick-or-treat" in the hand-drawn speech balloons is from a Serendipity grab bag. (They sell these bags of 10 unmounted stamps for only $1.00!! Awesome, huh? I ordered two and the owner, Mary Lee, made sure there were no duplicates in there. Great service!!!) The sentiment is actually on a trick-or-treat bag but I inked up only the words to use this time. You can see a project I made last year using the whole image here. I die cut DCWV patterned paper scraps for the holders with my Sizzix - Fancy Labels Dies. 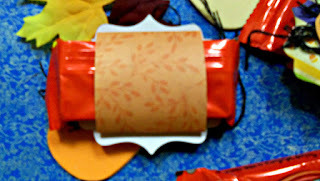 I used more scraps for wrapping around the candy bar. 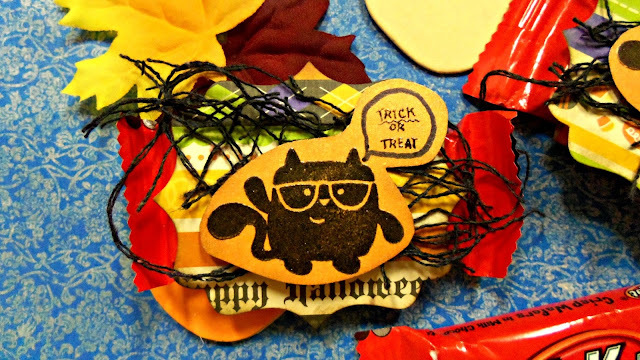 A few wispy scraps of the dollar store "spooky cloth" adds a bit of mystery. Fun, huh? I hope you will join the Cat Lovers Hop by linking up a cat themed project (by Nov. 1) and/or commenting on the linked projects (by Nov. 3). The Guidelines and FAQ page is here and you can link up on the main page. I am absolutely thrilled with the response to this hop!!! Right now we have 77 entries and still a day to go. Thank you so much for your excitement and participation!! And one more bat and cat meme to get you in the mood for my card! I want to thank each of YOU for the super-encouraging comments you've made about this hop. I'd never done anything like this before and it was kind of scary getting it all organized, and wondering if anyone would even be interested. I wasn't sure any sponsors would want to take a chance on a hop that had never been done before. You cat lovers have been FANTASTIC taking the time to send these sponsors notes of thanks on Facebook and/or their other pages. THANKS SO MUCH!!! I definitely am thinking about doing this again next year! Yay!! Today I am showcasing another of our generous sponsors: Waffle Flower. I hope you will join me in thanking them on their blog and/or social media spots. My card uses one of my very favorite cat stamp sets: On My Mark by Waffle Flower. (This set also has a dog on it, but we won't mention that on National Cat Day, will we?!!) I absolutely adore this looooooooooong cat. I do all sorts of antics with it on my cards. :) Today, though, I have the cat actually walking on all fours in a whimsical little spooky scene. 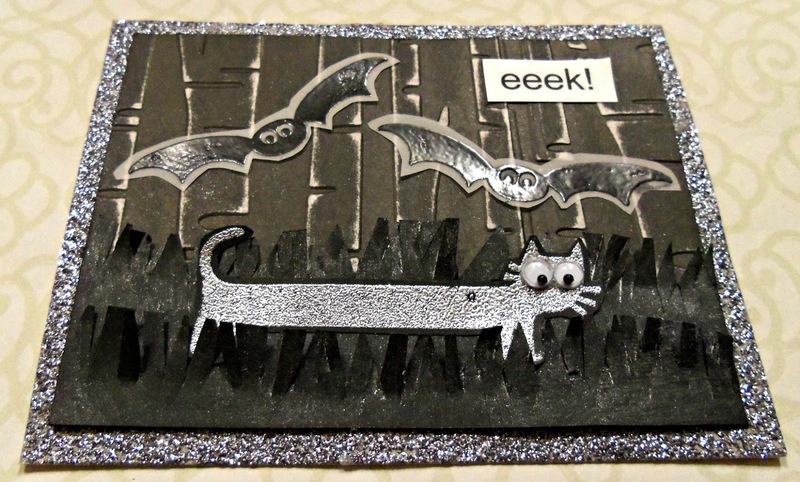 I dry embossed my background and sanded it to make moonlit highlights on the trees. 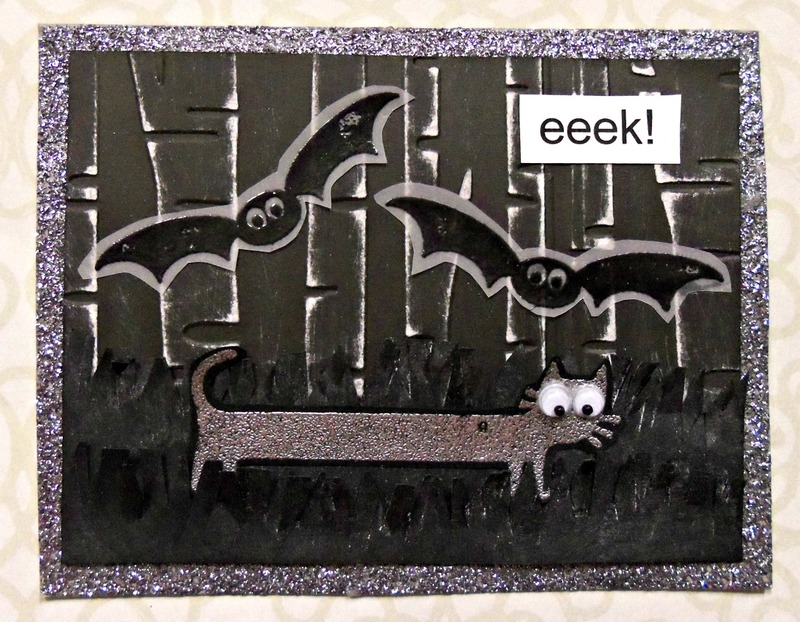 I stamped some bats on vellum with Versafine ink in Onyx Black and heat embossed them with clear powder. I cut them out with some of the vellum showing around the edges for more definition. I stamped my cat with Versamark ink on black cardstock and heat embossed with silver powder. For the grass, I cut two fringes of black cardstock and lightly brushed a silver ink pad over them to make them glisten a bit. Then I put my nervous cat in between the layers and lifted the blades of grass with a piece of paper slipped underneath them. Do you like his googly eyes? Hehehehe.... I finished it by mounting the whole thing on a glittery silver card base. 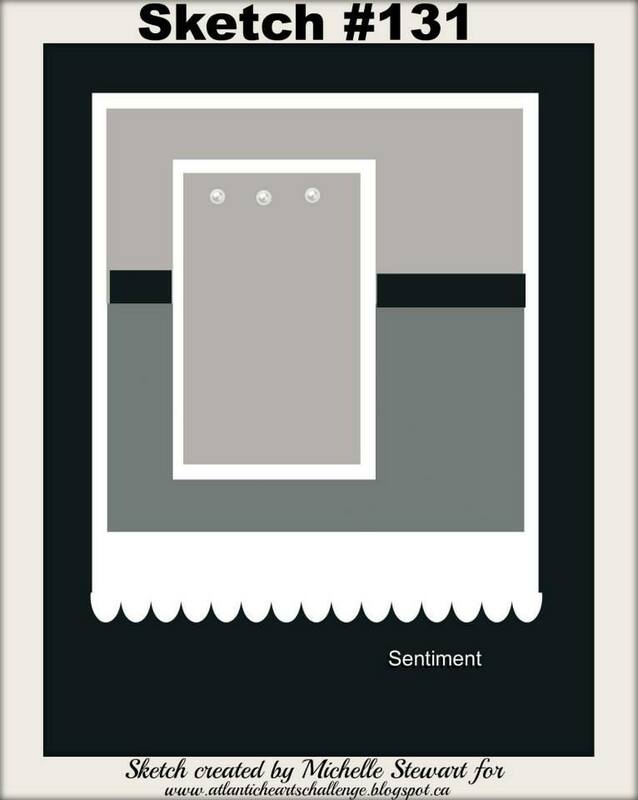 I hope you have enjoyed my card today. I'd love for you to join us in the hop. 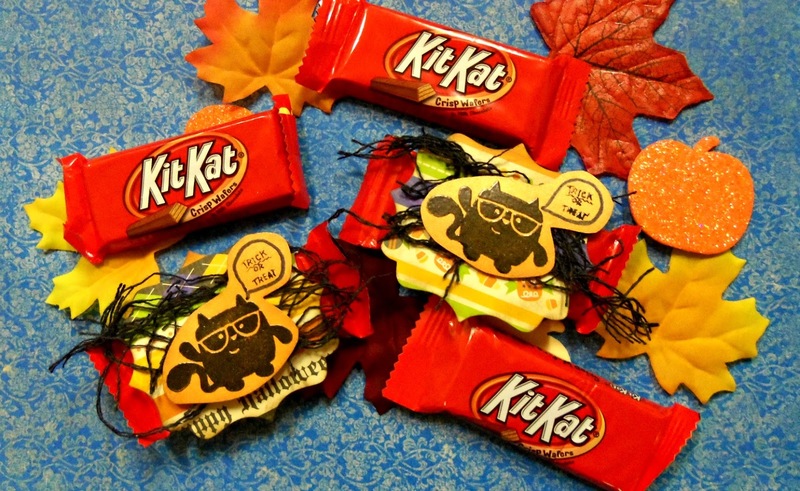 Read the Hop Guidelines and FAQs here and link-up a cat project through Sunday Nov. 1 on the main page and/or comment on the linked-up projects through Tuesday Nov. 3rd to be in the drawing for the fabulous prizes from our awesome sponsors!!! Thanks again for stopping by and for all your sweet comments about my projects and the hop. You make my cat day!!! 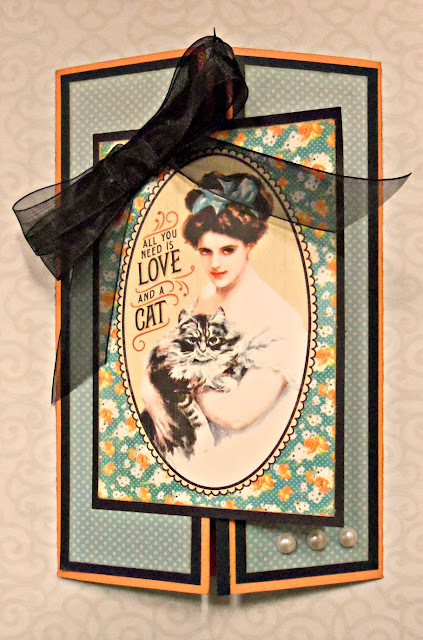 Also, if you just can't get enough cat projects and prize opportunities to satisfy your cravings here, there is a National Cat Day Hop over at Haidee's Created 2 B Unique blog. Did I mention she has a super-fabulous prize package for a random hopper??? Wow!! 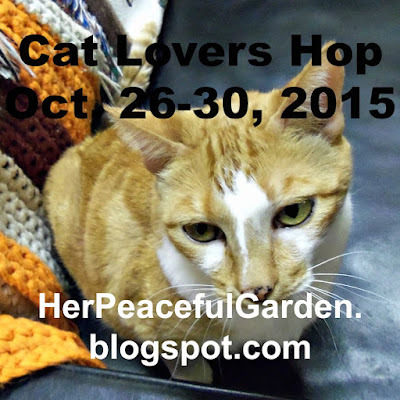 Tell her you saw her fun hop mentioned at the Cat Lovers Hop on Her Peaceful Garden. 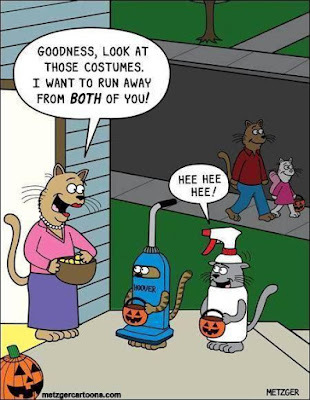 Enjoy today and be sure to pet your sweet kitties (and the other ones, too...lol...)!! COOLEST PICTURE EVER!!!! I don't know who it is, but I LOVE it!!! One of the generous sponsors of the Cat Hop is none other than........... Unity!!! 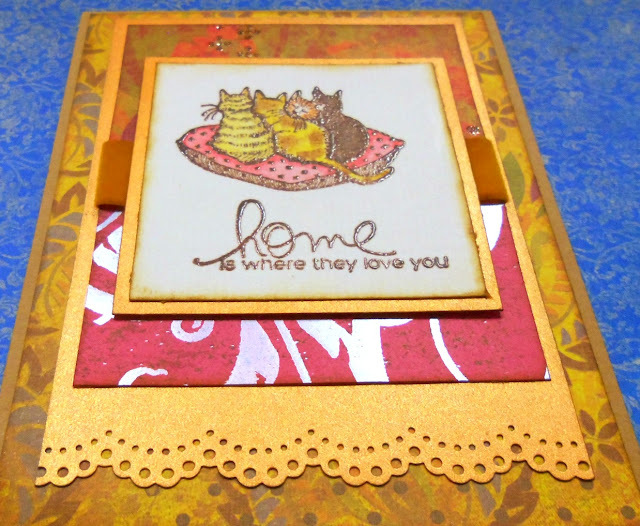 Today, also, is Unity's Designer Hop and Friends with Flair Link Up, so I am combining my weekly FWF post with a Cat Hop card. :) I hope you will join me in showing Unity how much we appreciate them for sponsoring the Cat Lovers Hop by visiting their blog and/or social media spots and telling them thanks!!! Here are some links: Unity blog, Unity Facebook, Unity Twitter, Unity Instagram. It is so awesome to see that several of you already posted thank yous to these companies!!! Cat Lovers are THE BEST!!!! You all make me so proud. I used some long-hoarded K&Co. 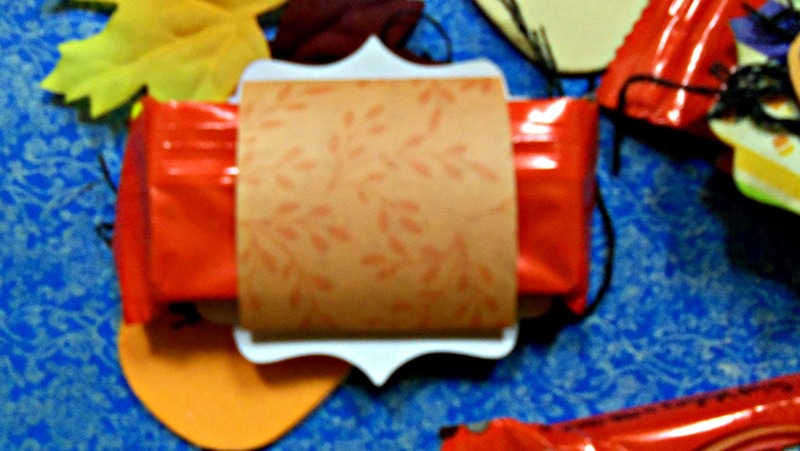 scraps for the background panels in bright autumn patterns and also some shimmery DCWV orange cardstock scraps. LOVE!!! 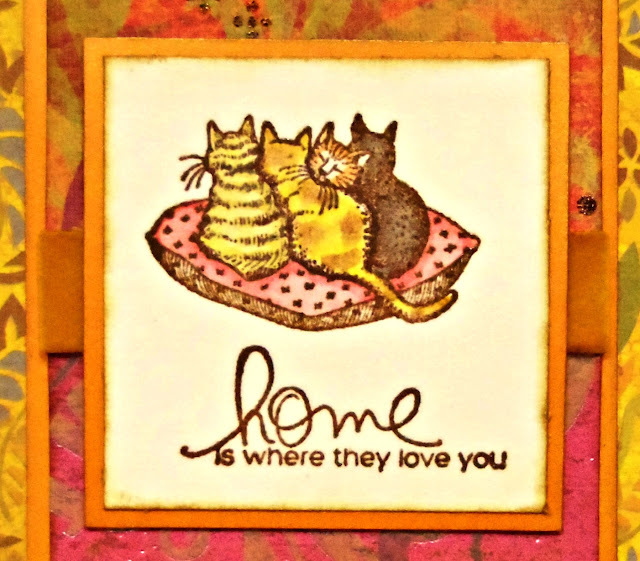 I stamped the image and sentiment with Versafine ink in Vintage Sepia and heat embossed them with clear powder. Then I colored the image with some Faber-Castell Art-Grip Aquarelle Watercolor Pencils I won a while back. (THANKS, F-C!!!) I inked the edges of the panels with Distress Ink in Brushed Corduroy. I hope you enjoyed my card. I absolutely LOVE how it turned out! See you later today with another cat project!!! Remember that there are fabulous prizes for some lucky random crafters who link up a project and for some lucky random commenters who visit the projects and leave some love. I hope you will do both. Today I am showcasing some products from another of the wonderful Cat Hop sponsors: Simple Stories. Are you familiar with their Cat SN@P products? This collection has playful little cards, stickers, etc for use in pocket scrapping or traditional....or, in my case, cardmaking. SO MUCH FUN!!! Simple Stories has donated two prize collections for the hop and I hope you will join me in thanking them at their blog and/or social media spots!!! Here are some links: Simple Stories blog, Simple Stories Facebook, Simple Stories Twitter, Simple Stories Instagram. I also want to thank you cat lovers who already visited many of our sponsors pages and left thank you notes. That means a ton to me that you did that!!! Here's my project for today. 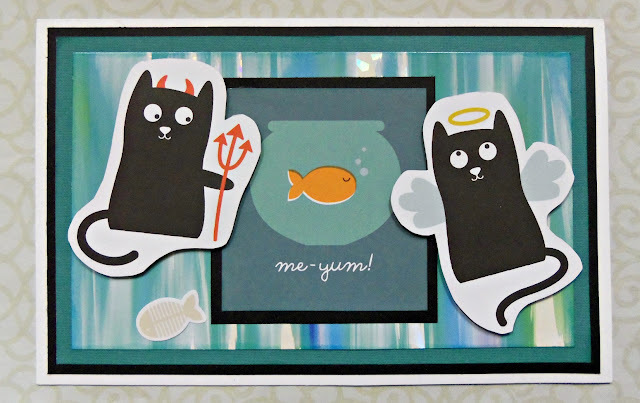 I used several of the Simple Stories Cat SN@P cards. Don't you love this little battle over whether or not to snag the fish???? I cut the angel and devil cards around the images to make them look a bit ethereal and trimmed the fishbowl card a bit to make it fit better. The Cat SN@P stickers come with the perfect images to enhance your projects. I put the fish skeleton sticker below the devil kitty. One thing I love about the simple images in the Cat SN@P products is that you don't have to make your projects be fussy. The basic colors and lines are perfect for making a project in a snap! Using simple lines and lot of layers of matting helps the images really tell the story!! I hope you are having fun on the hop so far this week. I sure am. I have enjoyed each of your projects so much and I have enjoyed the tales of misadventure of your cats. Ha. Someone asked me yesterday if we really have 20 cats. Well, yes.....we do. But I say that with some reservation because of the Crazy Cat Lady image that must conjure up in your mind!! (It's all true! Ha.) 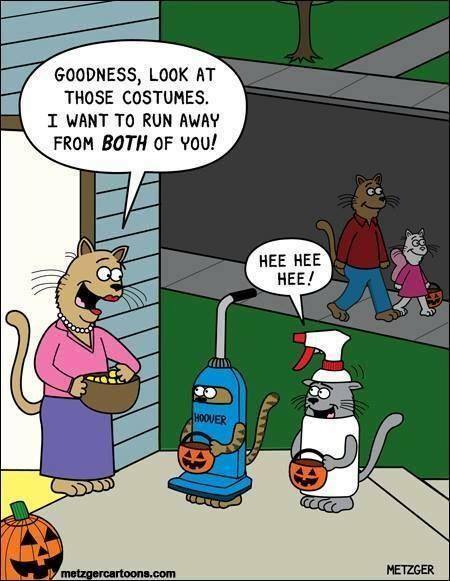 My hubby is a veterinarian and we live out in a very rural area, so it's not exactly like I am a cat hoarder....not exactly... All of our cats are spayed/neutered except one tom who lives under the house and eats on the back porch. His name is Big Bad Black.....but for a tom, he is quite well-behaved. He won't let us get near him but he accepts us looking at him...most of the time. Ha. 1. Ones that live here and are really, truly ours. 2. Ferals and strays that we can't touch, but that eat here. Category 1 (14 cats): Chaienne, Aliyah, Ivan, Andale, Tiger Lily, Geneva, Mistopheles, Marshmallow, Scamper, Othello, Andromeda, Whiskers, Ophelia, Alexander. So that is why I say 20+ cats. We sadly do lose a few each year, but our numbers seem to stay right around 20, for some reason. Strays find us during the winter and stay. People come up here and dump cats they don't want. We don't go looking, but any that find us are welcome. Okay, that's my cat tale for today. Hope you will share about your cats, too. I love reading about them!!! See you tomorrow with another cat project!!! Awww.....We all know the feel of that gentle head bump that our cats do when we reach down to pet them, don't we? Also, we know about the little happy "fist" this kitty is making. Sweet picture!! Welcome to my Day 1 post for the Cat Lovers Hop. I am delighted you are here to join us for a week of cats, cats, and more cats!!! This is your chance to talk about cats with other cat lovers, to comment on their fabulous cat projects, to make and share cat projects of your own, and to have a chance at some fabulous prizes!!!! Please read the Guidelines and FAQ page and go to the hop's main post for linking up. I am going to try to post a project each day that features products from one or more of our fabulous sponsors. Today I am sharing a card made with some of Graphic 45's "Raining Cats & Dogs". Did you know that Graphic 45 is donating some products from this line as a prize to a lucky random winner? How cool is that???? Graphic 45 blog, Graphic 45 Twitter, Graphic 45 Facebook Page, Graphic 45 Instagram. My crafty friend, Karen L., sent me some goodies from this G45 line (Thanks, Karen!!!) and I used one of the large cards as the focal panel for this gate card. I matted it in pumpkin and black as a nod to the season....but I don't really think it looks too Halloweenish, just a little bit autumny. 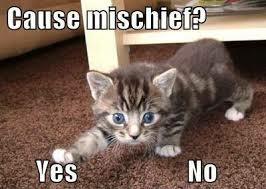 Anybody out there have a cat that looks like this kitty? I have one that sort of does. His name is Marshmallow. Marshy has more white on him than this fluffy armful has, but he's the closest one I have to this illustration. We used to say Marshy was a "big soft clump of somethin' sweet". He was born feral, but his mommy disappeared. We captured him and his sister, Scamper, when they were eating on the back porch at our old house. They were crouching all the way inside the food pans. We refer to this as "the way wild kittens eat". Hard to believe they are 9 years old now! Here's a photo of the card partially opened up, so you can see the gate effect. A big sheer black bow and some pretty pearls finished it off. I love the vintage look!! Thanks for stopping by. 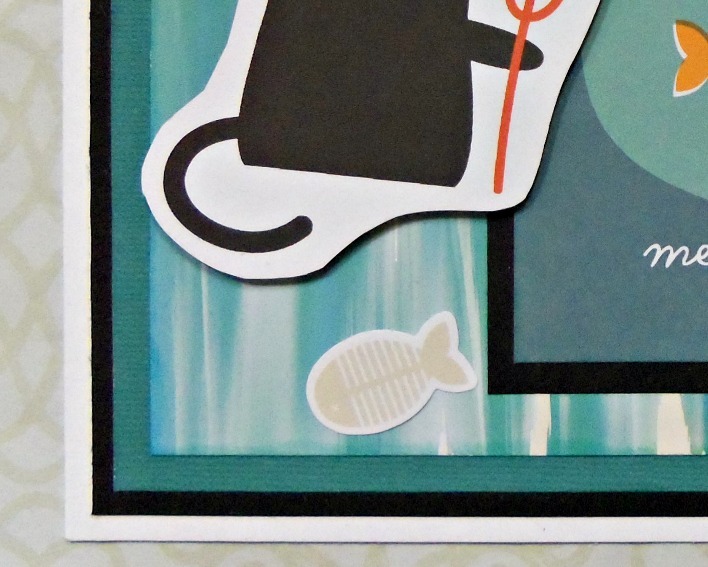 I hope you will join in the hop by commenting and/or linking up a cat-themed project on the main post!! Also, I hope you will tell us all about the cats at your house. I promise you'll be getting an earful about my tribe of 20+ cats!! !